Rex Book Store and ABS-CBN Lingkod Kapamilya Foundation Inc. recently teamed up to provide books that will give the children of 11 Bantay Kalikasan sites more opportunities to learn. 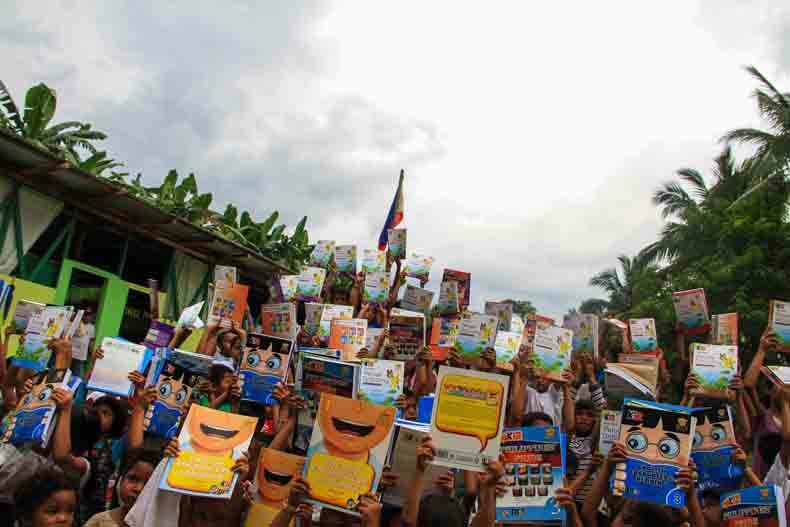 The generous textbook donation of Rex Book Store kicked off in Lobo, Batangas and Baco, Oriental Mindoro. The schools we visited were Mabilog na Bundok Elementary School and Lobo Institute of Lobo, Batangas, Bayanan Elementary School and Baco National High School of Baco, Oriental Mindoro. Representatives of Rex Book Store arrive early morning of August 8, 2016 in Lobo, Batangas. Eager to distribute the textbooks, Rex employees unloaded and organized the books in front of the Mabilog na Bundok Elementary School classrooms. We went room to room and distributed 1,335 new books to close to 300 students from Grades 1 to 6. As we finish distributing books to each class, we could hear the excited chatter as the students hastily open their books to check what’s inside. The teachers can’t express enough gratitude as they held the books in their hands. “Salamat sa Rex Book Store kasama ng ABS-CBN Foundation, malaking bagay ito dahil natugunan ang kakulangan namin sa libro. Angkop na angkop ang mga libro sa kinakailangan namin na curriculum.” Principal 1 Beverly Ebreo of The Mabilog na Bundok Elementary School joyfully exclaimed her gratitude. Lobo Institute has always been a partner of the environment, where there are environmental rallies; you will find uniform clad students marching together with the other residents of Lobo, Batangas. On June 20, 2016, hundreds of people congregated in front of the Lobo Municipal hall to show support in the ongoing final reading of the total ban of mining in Lobo, Batangas. Students of Lobo Institute shared the loud voice of the pro-environment residents of Lobo, Batangas. On December 15, 2015, Typhoon Nona – one of the strongest typhoons to hit the Philippines – brought devastation to Oriental Mindoro. Typhoon Nona caused flooding with mud. A landslide was also seen at Mt. Halcon, and Barangay Bayanan was wiped out in an instant. Mud, soil, and boulders from the mountain tumbled down Brgy. Bayanan through the two rivers encircling it. The aftermath in hardest hit area of Oriental Mindoro – the Baco Municipality reflected people’s miseries: no clean water, gray sky, huge chunks of rocks and debris, muddy floors on every home. Eight months after, Rex Book Store visits Baco for the first time on August 9, 2016. The mud has been cleaned up in Baco but the rocks and boulders in Bayanan were still there. Classes of Bayanan Elementary School are conducted in makeshift classrooms where 332 students from Grades 1-6 are all cramped in 3 classrooms, sharing what tiny space they have with each other. In just a few minutes, the students congregated in front of the mound of rocks they made into a stage. A student sang to us: “Sundan mo ng tanaw ang bukas, mundo’y punan mo ng saya at gawing makulay.” Rex Book Store is here to make a difference. The books will hopefully bring smiles and color to the Bayanan students. A marching song was played before the book giving, the kids sang simultaneously: “Baco, Ginintuang lupain na puno ng yaman.” We realized that beyond the material things, these kids we are passing the hope on are the real wealth of this nation. Junalyn Cortez, Industrial Relations Head of Rex Book Store emotionally delivered her speech, thanking ABS-CBN Foundation for bringing them to Bayanan and in even such a small way as giving books, they know they can help in shaping the future of these kids. The kids sang the 2015 ABS-CBN Christmas Station ID: “Tuwing pasko, mas ramdam mo, dama sa ating tinig ang init ng pag-ibig. Thank you Thank you for the love.” Head Teacher Ednalyn Gunday thanked Rex Book Store and ABS-CBN Foundation for the books, it is indeed an early christmas gifts to the teachers and the kids. Still moved to tears, Rex Book Store and ALKFI headed back to the main road and into Baco National High School. As the sudden downpour of rain started, Principal II Dante A. Castillo recounted the devastation Typhoon Nona brought. The mud and flooding damaged books in each classroom and their library. They tried to salvage what they can but there were not a lot of books left. He profusely thanked Rex Bookstore for giving Baco National High School new books that will cater to the sheer amount of students attending BNHS. The students of Baco National High School showed their support, holding on to their umbrellas as the rain poured. Rex Bookstore and ALKFI were greeted with myriad of performances from students and teachers alike. As the day drew to a close, we look back on the two days that Rex Book Store and ALKFI – Bantay Kalikasan spent together distributing books. What have we learned and how did our actions reflect in the mission of Rex Book Store and ALKFI. Rex Book Store commits to develop and publish books and other supplemental materials that will enable students and learners to contribute and excel in a complex, rapidly evolving, global, highly technological and environmentally fragile world. ABS-CBN Lingkod Kapamilya Foundation Inc. commits to make a significant impact in the strategic areas of childcare, environment, education and disaster management by leveraging the power and reach of media and partnering with concerned sectors of society. What we realized is that although Rex Book Store and ALKFI are two different organizations, we do share the same mission. Books are a reminder that every paper we take from trees will enrich the minds of the children that will protect the environment. It is a give and take relationship that we must form in order for our world to be more sustainable. Rex Book Store and ALKFI are doing all these good deeds for two reasons: Para sa Bata, Para sa Kalikasan.